If you have known me for the past 15 years or so, you know that donating my hair is something that is very important to me. When I was in high school, I decided that I would donate my hair as many times as I could. I am proud to say that this is my 4th donation. 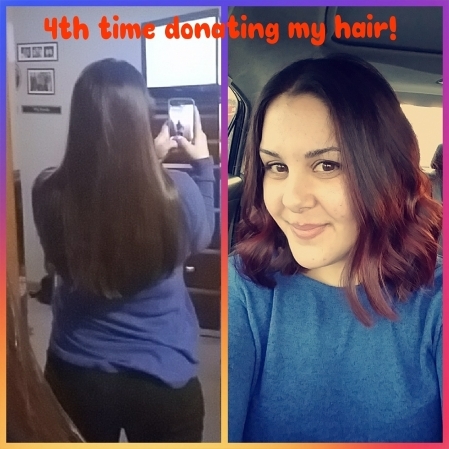 In the years past, I sent my hair to whichever charity my salon send to, but this year I did some research and found this wonderful organization Hair We Share. Along with the donation of hair that I sent in, I am trying to raise money, so that I can completely donate a wig 100%. The hair and the fundraiser would give the product, the creation and gifting of a wig to a kid in need. This puts my whole passion for donating hair in motion. Anything you can give will be sincerely appreciated. It would really, genuinely mean the world to me. Thank you so much for supporting me in such a wonderful cause. you are awesome ! and a special person ! I’m so proud of you. Love you.